If you have been arrested for an alcohol DUI, it may be your first experience with facing a criminal charge. If convicted, you could face jail time, fines, suspension of your driving privileges and increased insurance rates. Convictions can also have negative consequences on your employment, especially if you are a licensed professional or a commercial driver. There are two ways your driving privilege in CA can be suspended. If you lose or default on the DMV hearing, a 4 month to 1 year suspension can occur. If you get convicted in court, it will trigger a 6 month to 2-year suspension. In some cases, your license can be revoked for up to 10 years. If you were not on DUI probation at the time you got arrested, in most 1st offense cases you are eligible for a work restricted license after 30 days, on a 2nd offense after 90 days, and 3rd offense after 180 days. After you are released from jail, you are given a court date for your arraignment. Arraignment is where the government tells you the charges and potential punishment you face. If you hire an attorney, your attorney can appear so you never have to go to court. If you don’t hire an attorney, you must appear at your first court date or a warrant will be issued. Don’t confuse your court date with your DMV Hearing date. At the time of your arrest, the police take your license and give you a Temporary License/Notice of Suspension. This piece of paper is your new temporary driver’s license so keep it with you. If you had a valid driver’s license at the time, you can continue to drive until the outcome of the DMV action. If you request a DMV hearing, you will be allowed to drive until a decision is rendered on the DMV hearing. If you don’t set a DMV hearing, your driving privilege will be suspended 30 days after your arrest. The notice of suspension notifies you of your right to a hearing to contest the action against your license. Most people don’t read it, but it says that you have 10 days to request a DMV hearing. You must read your temporary license and notice of suspension because it contains important information regarding your legal rights. Often the amount of alcohol consumed would not generate a Blood Alcohol Concentration (BAC) as high as the government claims. If you drank (3) 4 oz glasses of wine or (3) 12 oz beers, or (3) 1 oz shots over 2 hours and the cop tells you your BAC is 0.14, that is scientifically impossible and you are being wrongfully accused. These are rough estimates with many factors that influence the results. But if your estimated BAC is lower than the government’s breath test result, there is a problem with the government’s case. The biggest breath testing problem leading to wrongful convictions is the conversion of breath alcohol to blood alcohol. Breath machines are calibrated to assume that your “breath alcohol” result accurately reflects your blood alcohol concentration (BAC) based on a ratio of 2100:1. That is, for every 2100 parts of ethanol in the blood there is one (1) part ethanol in the breath. The problem is that ratios in the population range from 900 to 3400. So if the breath machine reads 0.08% and your Blood:Breath ratio is 1300 (not 2100 like the machine assumes) than your true blood alcohol concentration (BAC) would be 0.05% which is under the legal limit. People assume that if you blow over the legal limit you’re guilty, but as you can see you may be innocent. During the absorption stage which can last three hours or more after you finish drinking, the BAC in arterial blood is as much as 60% higher than the BAC in venous blood. Because the alveolar deep-lung air blown into the breath machine is bathed in arterial blood, not venous blood, a falsely high BAC is generated. Most credible scientists agree that a breath test should not be given while a person is still absorbing alcohol. If you suffer from GERD, acid reflux or heartburn, it can “fool” the breath machines, causing a false high reading. GERD causes alcohol vapors in the stomach to travel back up through the esophagus, throat and mouth. When these “mouth alcohol” vapors are blown into the breath machine, it causes a false high reading. A high protein low carb diet produces compounds called ketones. If a person consumes carbs, as in drinking alcohol, when these ketones are present, the body will produce isopropyl alcohol. Since ethanol and isopropyl alcohol are not distinguished by most breath testing machines it can result into a falsely high-test result. If you are hypoglycemic, borderline diabetic or if you have diabetes, then the consumption of alcohol, even in small amounts, will cause your body to convert elevated levels of acetone into isopropyl alcohol. Since ethanol and isopropyl alcohol are not distinguished by most breath testing machines it can result in a falsely high result. Breath machines can be “tricked” by mouth alcohol caused by burping, dentures, braces, trapped food particles, or the recent use of cough syrup or mouth wash. The mouth alcohol contamination is added to the breath test result. Since breath machines measure alcohol molecules, a little contamination can cause a falsely high result. 10. Fermentation of the blood sample occurs when microorganisms in the blood sample use glucose in the blood to ferment and create ethanol. There is NO WAY to distinguish between alcohol consumed by a subject and alcohol CREATED BY FERMENTATION. Even if the breath machine or blood analysis is perfect, machine error still exists for both testing procedures. 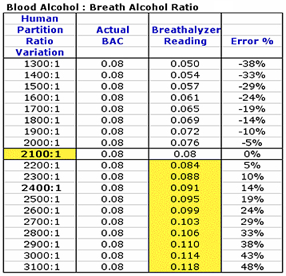 For breath tests the error rate is about +/- 0.02 and for blood it’s +/- 0.01. If your blood alcohol concentration is rising when you are given the test, you may have been under 0.08 at the time of driving. Since blood alcohol levels can increase by 0.02 or more an hour, if 2 hours pass from the time you are stopped till the time of the test you could easily rise from 0.07 to 0.11 and therefore innocent of DUI. In both the (a) and (b) count the government has to prove (1) that you were the driver and (2) the vehicle actually moved. It’s difficult for the government to prove who the driver was in cases where there is an accident and the car is abandoned. The best defense to a DUI is if you weren’t the driver. Police have to give you the Miranda advisement when you are in custody and being interrogated. If Miranda rights were violated, your statements will be excluded from evidence. Police officers can’t arbitrarily pull you over. A lawful stop requires the officer to articulate “specific facts” indicating a “reasonable suspicion” that you were committing a traffic violation. If the DUI officer can’t meet this standard, you may get a judge to dismiss your DUI case. Even if you are convicted of a DUI, you can still get your case expunged. An expungement allows you to lawfully answer that you have never been convicted of a crime. To be eligible, you must have successfully completed probation, paid all you fines, and completed the terms of your probation. DUI expungements are not mandatory but are discretionary. When you hire our law firm we will help you with your expungement when you become eligible so that your criminal record is as clean as possible moving forward in life. We have successfully represented many drivers accused of DUI. We have obtained acquittals, dismissals and reductions of DUI charges, and have had DMV suspensions set aside. Call our office today at (916) 939-3900 or (530) 621-1800 to speak directly to an attorney about your Alcohol DUI case. We are open 24/7/365 to answer your questions.